Click here to register for your chance to win! This newly revised and updated first edition of Inside Ultrasound’s Vascular Reference Guide is a complete guide to vascular disease, noninvasive testing and interpretation - a must have for all students, educators, technologists, sonographers and physicians. Each section contains: topic definitions, principles, etiology of disease, risk factors, indications, contraindications, mechanism of disease, location of disease, patient history, physical exam, exam protocols, interpretation, differential diagnosis, correlation and medical, surgical and interventional treatments, as well as “protocol at a glance” sections, for easy test referencing. QR codes can be found throughout this book which will allow you to view video clips of various pathology or duplex findings using your smartphone or tablet. 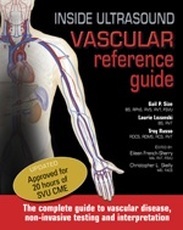 “Terry Reynolds calls Inside Ultrasound’s Vascular Reference Guide a masterpiece. He’s right. The life’s work of one of the most respected authorities in the field, it is painstakingly and gorgeously illustrated, bristling with facts, figures, formulas, conversion tables, correlative data, and other information that cannot easily be found elsewhere”. --Janice Hickey Scharf RDMS, CRGS, BSc.